Prior to each SCMS Festival, we commission a Preview Lecture from a local musical expert, which is related to the programming of our upcoming concert series. Topics are varied, and can include musical themes, biographical sketches of composers, or the history of musical forms. The lecture is presented at several area locations, including retirement communities and social clubs. We strive to offer at least one presentation in a public setting. If you are interested in hosting an SCMS Preview Lecture, please contact our Director of Education. How do musicians use music to talk to each other? How do composers use their music to convey a story or communicate with past composers? Can we really communicate with the underworld through music? 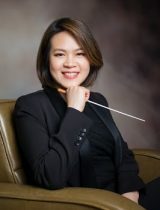 Dr. Julia Tai, Director of Orchestra at Seattle Pacific University, Music Director of Philharmonia Northwest, and the founder and Co-Artistic Director of the Seattle Modern Orchestra, will guide you through musical selections from the SCMS Winter Festival programs and show how music can be more powerful than words in creating dialogues.